Let's continue the conversation about hot Spring 2018 edits from top retailers and brands! In my last post, I created a wardrobe edit of Banana Republic's new styles for the spring season. This time around, I'm honing in on what French Connection has to offer us this season! French Connection is a modern, contemporary brand that offers beautiful pieces for your wardrobe including clothes, shoes, accessories (sunnies, watches, etc.). 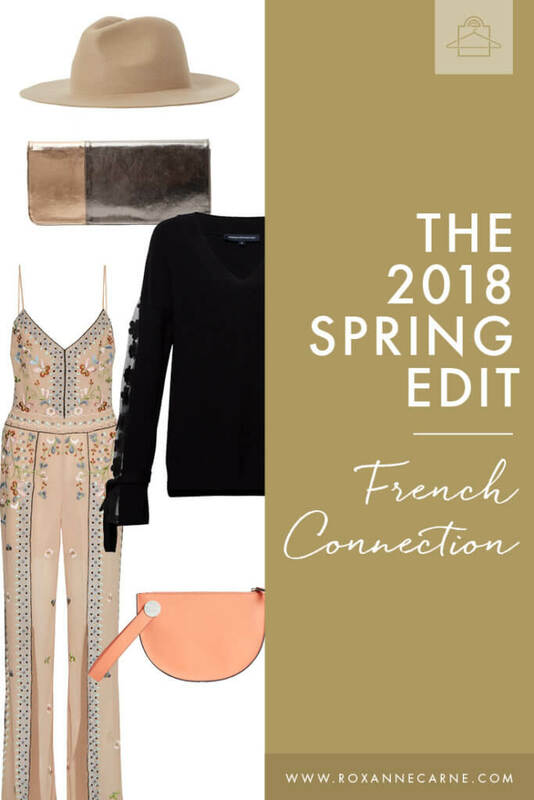 I like that their style is feminine but can surprise you with slight pops of edge, flirtiness, or a bit of something unexpected – actually, I LOVE that about French Connection! And what's more is that they have GREAT pricing on their unique pieces so you don't have to break the bank to experiment with new, different looks. This top is a great example of lace being done right! Lace can be tricky to style because it's one of those fabrics that can look either really formal or really frumpy really quick, LOL. It's all about the quality and balance. The relaxed, long-sleeved jumper is embellished with just enough dainty lace for a pretty twist on casual wear. See? That's the bit of ‘something unexpected' I was talking about! 😉 This would pair well with skinny or bootcut jeans, or leggings, too! And while we're on the subject of jumpers, another favorite of mine is the French Connection's contemporary tie-detail jumper. This gently ribbed knit sweater looks business in the front, but it's a total party in the back! The back of this jumper is everything! It has three cute black bows that, when tied, gently leave the back slightly open. Now pump the brakes! Before your mind goes racing with the thoughts of being backless and wondering about your bra choices for a casual look, know that you can rock this type of top with a strapless backless bra. 😉 I don't know about you, but I would rock this jumper a hot minute! Sheer…suit…what? Don't have a conniption! French Connection has done it yet again to bring us something that's out of the norm, but really cool at the same time. Disclaimer: these pants are definitely for the daring! These sheer wide-leg pants have black satin strips running along the length of the legs, with an option to have a subtle slit near your ankle! Pair this with a bodysuit and strappy sandals for a fearless, modern look! These pants literally stopped me in my tracks as I curated this edit for you. They blend interesting ingredients that serve up a stylish dish: leather, bold colors, color blocking, and a cropped leg with zippered side slits. I really can't say more than that! These pants are cute for days! Pair them with the jacket pictured in the gallery below, or a solid or graphic tee. Heeled pumps or sandals provide the perfect complement to these pants! Lately, I have been really into bar jewelry: necklaces, earrings, everything! It must be my Minimalist style archetype peeking out a bit! Anyhow, I'm digging this pretty diamanté crystal bar necklace from French Connection. It's a light piece that can still draw attention without being too contrived. When it comes to style, a lot of the times, less is more. It's a great piece to have as a subtle accent to your outfit. I recommend wearing this with an open-collared shirt, scoop neck or boat neck top. When you first look at this stylish sneakers, you'll probably do a double-take! At first blush, you may think that these shoes have smeared soles, but that's not the case at all. The leather slip-on trainers are adorned with a marble-style finish making it look oh so unique! Give your athleisure look a kick with these kicks! Another great example of an understated, yet intriguing look from French Connection! Explore or shop the looks by clicking on an item’s image below! Don’t miss out as these popular items won’t be available for long! Okay, there you have it! Which pieces from this edit are YOUR absolute favorites? Comment below or post it on my Facebook page!